Pita Garcia was born in Espanola, New Mexico, the second of twelve children for Gregorio and Mauricia Garcia. 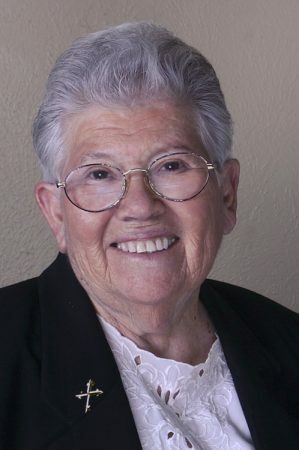 She entered the community in 1950 and in 1951 she received the habit and the name Sister Maria Teresita. She taught primary grades in Michigan schools for eleven years. In December of 1963, she went to Chimbote, Peru where she supervised religion classes, and helped found and direct a school of religious studies for teachers. She served on the Diocesan Catechetical Commission, was Vicar for Religious for three years and was Diocesan Director of the Family Catechesis Program. In 1989, she returned to the states and served as coordinator of religious education at her home parish, Sacred Heart in Espanola. In 1993, she was named Parish Administrator in Fort Sumner, New Mexico and served in that capacity until 2008. Sister Teresita preaching with St. Dominic. Sister Teresita prays at a funeral. Sister Teresita spent nearly two decades in Chimbote, Peru, one of the first of the Grand Rapids Dominican Sisters to go and build this ministry.